Soda and children. Let’s just get right to it. I have a soda probably once a month or so. I don’t buy it for the home, but if I am out and about and perhaps eating at the nearest Subway, I’ll order a root beer and love every second of it. As my daughter would say: “ssssllllpppp! yum!” (though she hates root beer because, “it’s too tickly”, whatever that means). Anyway, I prefer water or milk (BORING! I know. I am boring in this way and this way only. Ok, maybe in a few more ways. I didn’t drink alcohol until AFTER graduating high school. And only wine coolers at that, which is not quite boring, but rather, cheesy? I’ll take cheesy. Today, a wine cooler would put me under the table.) How did I get to alcohol. Back to soda. Do you call it Pop? Soft Drink? Soda? Coke? Cola? Crack? Anyhoo…so, I don’t drink it on a regular basis. If it was in my house, I’d probably drink a little more of it. My husband takes to soda like he does food: if it’s in the fridge, he’ll consume it. Lucky for me, I do the grocery shopping. Unlucky for him, I don’t buy beer all that often. I try to buy it when I have all 3 kids with me, and only when they are especially rowdy and I’ve had to scold them (loudly) at least five times while in the grocery store, so that when my little circus arrives at the check out lane, all the men in line nod at me approvingly as I sling the case of beer onto the conveyor belt, because, hey, “this lady needs a beer!”, and because I also love the disapproving looks from the mostly older women who shake their heads with a tsk tsk “that mom shouldn’t be drinking, no wonder her kids are misbehaving!”, cuz other people’s opinions are funny to me. I am back to alcohol. What is happening. Ok, so this one time, my darling son, at the tender age of 3 or so, was out with some very fabulous people that I love very much. I must have this disclaimer. If you are reading this, and you know who you are, I love you, very much! 🙂 So, he was out and about, enjoying his evening with fabulous people. They brought him home around 6pm, close to bed time. I went out to greet them in the drive way, and he climbed out of their car, clutching to, and sucking the life out of, a large cup. “What’s in the cup?” I asked. Silence. “What’s in the cup.” No longer a question. A demand. The answer: “Oh, uh, it’s a soda. We asked him if you let him have soda, and he said Yes, so…” I flinched. I grabbed the cup away. Empty. All the care I took feeding this child milk and watered down apple juice for heaven’s sake, down the drain with 1 soda, super sized. Well, that’s what a I thought, anyway. Give me a break, it’s my first child. My 11 month old has, for sure, had apple juice, straight up. No water added. Third kid. You know. Anyway, so, the soda and my first kid. “Please tell me it’s Sprite.” That seemed the safest to me…sugar bugs, yes, but no caffeine. “No, it’s Mountain Dew.” Remember, I love these people a lot. I wanted to slap someone. I threw a bit of a hissy fit. And probably embarrassed myself. They didn’t mean harm, I mean, he TOLD them I let him have soda. Maybe instead of worrying about pure apple juice, I should have taught him not to lie. So after threatening to send my hyper caffeinated child home with them (“well maybe YOU should stay up till 3am with him!”), we said our goodbyes and in the end, he was only up till midnight. And of course up by 6am. And I got a call the next morning, from the people we love, making sure he wasn’t up too late and apologizing, and all was forgotten. At least so I thought. As my son grew older, I loosened my leash on fizzy drinks. When we took him to Disneyland for his 4th birthday, after getting up at 6 and having such an exciting morning, at lunch he started to fade. Like fall into his plate and take a snoozer. Ahh! We had spent too much money for him to nap through any parts of it, so I gave him a few sips of my Coke to wake him up. It was Disneyland. Forgive me. Thanks. Anyway, mom’s that throw hissy fits are sort of unforgettable. About a year later, I got a lovely bag of hand me downs from another loved one, left on my doorstep. A bag full of awesome boy clothes. And the shirt on top? So when I opened it, I knew all wasn’t forgotten and people were still laughing at me? (Lovingly, of course.) A bright green Mountain Dew shirt. Size 6. Ha Ha. Did some backyard camping with the fam. 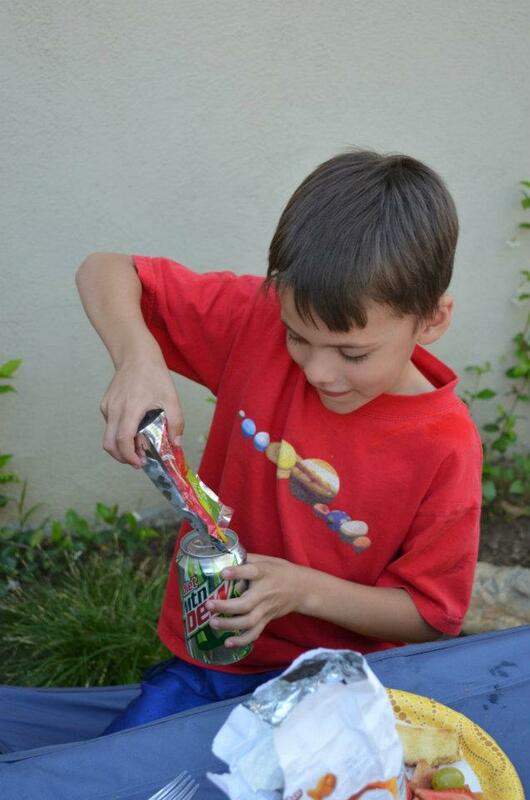 Looked up from my plate of food to see my son attempting to squeeze his juice pouch into a can of Mountain Dew. He apparently thought it was funny. Juice and soda all in one day? Try one hour. What is camping for if not for throwing all mom’s rules into the campfire? Oh geez.